The Epistle to the Romans or Letter to the Romans, often shortened to Romans, is the sixth book in the New Testament. Biblical scholars agree that it was composed by the Apostle Paul to explain that salvation is offered through the gospel of Jesus Christ. It is the longest of the Pauline epistles  and is considered his "most important theological legacy" and magnum opus. 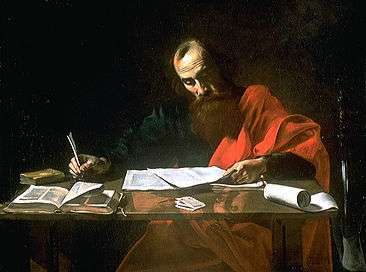 The scholarly consensus is that Paul authored the Epistle to the Romans. The letter was most probably written while Paul was in Corinth, probably while he was staying in the house of Gaius, and transcribed by Tertius his amanuensis. There are a number of reasons why Corinth is considered most plausible. Paul was about to travel to Jerusalem on writing the letter, which matches Acts[Acts 20:3] where it is reported that Paul stayed for three months in Greece. This probably implies Corinth as it was the location of Paul’s greatest missionary success in Greece. Additionally Phoebe was a deacon of the church in Cenchreae, a port to the east of Corinth, and would have been able to convey the letter to Rome after passing through Corinth and taking a ship from Corinth’s west port. Erastus, mentioned in Romans 16:23, also lived in Corinth, being the city's commissioner for public works and city treasurer at various times, again indicating that the letter was written in Corinth. In addition to Paul’s geographic location, his religious views are important. First, Paul was a Hellenistic Jew with a Pharisaic background (see Gamaliel), integral to his identity: see Paul the Apostle and Judaism for details. His concern for his people is one part of the dialogue and runs throughout the letter. Second, the other side of the dialogue is Paul’s conversion and calling to follow Christ in the early 30s. Joseph Fitzmyer argues, from evidence put forth by Stirewalt, that the style of Romans is an "essay-letter." Philip Melanchthon, a writer during the Reformation, suggested that Romans was caput et summa universae doctrinae christianae ("a summary of all Christian doctrine"). While some scholars attempt to suggest, like Melanchthon, that it is a type of theological treatise, this view largely ignores chapters 14 and 15 of Romans. There are also many "noteworthy elements" missing from Romans that are included in other areas of the Pauline corpus. The breakdown of Romans as a treatise began with F.C. Baur in 1836 when he suggested "this letter had to be interpreted according to the historical circumstances in which Paul wrote it." Paul now begins into the main thrust of his letter. He begins by suggesting that humans have taken up ungodliness and wickedness for which there will be wrath from God. [1:18] People have taken God's invisible image and made him into an idol. Paul draws heavily here from the Wisdom of Solomon. He condemns unnatural sexual behavior and warns that such behavior will result in a depraved body and mind[1:26–27] and says that people who do such things (including murder and wickedness [1:29]) are worthy of death. [1:32] Paul stands firmly against the idol worship system which was common in Rome. Several scholars believe the passage is a non-Pauline interpolation. The fragment in Romans 13:1–7 dealing with obedience to earthly powers is considered by some, for example James Kallas, to be a gloss incorporated later. (See also the Great Commandment and Christianity and politics). The concluding verses contain a description of his travel plans, personal greetings and salutations. One-third of the twenty-one Christians identified in the greetings are women, some of whom played an important role in the early church at Rome. Additionally, none of these Christians answer to the name Peter, although according to the Catholic storyline, he had been ruling as Pope in Rome for about 25 years. Possibly related was the Incident at Antioch between Paul and Peter. Luther controversially added the word "alone" (allein in German) to Romans 3:28 so that it read: "thus, we hold, then, that man is justified without doing the works of the law, alone through faith". The word "alone" does not appear in the original Greek text, but Luther defended his translation by maintaining that the adverb "alone" was required both by idiomatic German and Paul's intended meaning. This is a "literalist view" rather than an literal view of the Bible. The Romans Road refers to a set of scriptures from Romans that Christian evangelists use to present a clear and simple case for personal salvation to each person. They are: Romans 3:23, 3:10, 6:23, 5:8, 5:11, 10:13, 10:9 and 10:17. ↑ Felix Just, S.J. (2 September 2005). "New Testament Statistics: Number of Chapters, Verses, and Words in the Greek NT". Catholic-resources.org. Retrieved 18 September 2013. ↑ Bruce M. Metzger, A Textual Commentary on the Greek New Testament (2001), p. 477. ↑ Ambrosius, Works, iii 373. ↑ Easton, Matthew George (1897). "Romans, Epistle to the". Easton's Bible Dictionary (New and revised ed.). T. Nelson and Sons. ↑ Geneva Study Bible on Romans 16:5, regarding the "church" (translated as "company" or congregation in some 16th-century translations) says: (b) The company of the faithful, for in so great a city as that was, there were different companies. ↑ Acts 18:1–2 "After these things Paul departed from Athens, and came to Corinth; 2 And found a certain Jew named Aquila, born in Pontus, lately come from Italy, with his wife Priscilla; (because that Claudius had commanded all Jews to depart from Rome:) and came unto them." ↑ Fitzmyer, 77 also argues that this may be what Paul is referring to when he talks about the "strong" and the "weak" in Romans 15; this theory was originally put forth by W. Marxsen, Introduction to the New Testament: An Approach to its problems (Philadelphia: Fortress, 1968) but is critiqued and modified by Fitzmyer. Fitzmyer's main contention is that Paul seems to be purposefully vague. Paul could have been more specific if he wanted to address this problem specifically. ↑ s.v. "Romans, Letter to the"
↑ for all of these comparisons see Ben Witherington's commentary on Romans, p. 63 which is available on a limited preview basis from Google books. ↑ Percy Neale Harrison, Paulines and Pastorals (London: Villiers Publications, 1964), 80-85; Robert Martyr Hawkins, The Recovery of the Historical Paul (Nashville, TN: Vanderbilt University Press, 1943), 79-86; Alfred Firmin Loisy, The Origins of the New Testament (New Hyde Park, NY: University Books, 1962), 250; ibid., The Birth of the Christian Religion (New Hyde Park, NY: University Books, 1962), 363 n.21; Winsome Munro, Authority in Paul and Peter: The Identification of a Pastoral Stratum in the Pauline Corpus and 1 Peter, SNTSMS 45 (Cambridge: Cambridge University Press, 1983), 113; John C. O'Neill, Paul's Letter to the Romans (Harmondsworth: Penguin Books, 1975), 40-56; William O. Walker, Jr., "Romans 1.18-2.29: A Non-Pauline Interpolation?" New Testament Studies 45, no. 4 (1999): 533-52. ↑ "Blue Letter Bible". Blue Letter Bible. ↑ Douglas J. Moo, The Epistle to the Romans (Eerdmans, 1996), 748. ↑ Edward J Anton, Repentance: A Cosmic Shift of Mind and Heart (Discipleship Publications, 2005) 30. ↑ Douglas J. Moo, Romans: The NIV Application Commentary: From Biblical Text to Contemporary Life (Zondervan, 2000), 399. ↑ Douglas J. Moo, The Epistle to the Romans (Eerdmans, 1996), 756–758. ↑ The Sword and the Ploughshare Romans 13:1–7 an Interpolation? ↑ For an authoritative discussion of the Catholic viewpoint, see Catholic Encyclopedia, s.v. "Epistle to the Romans"
↑ Works, Expositions of the Psalms (121–150), 2004, New City Press, ISBN 1-56548-210-7 ISBN 9781565482104, Part 3, volume, 20, p. 446. ↑ Works, Expositions of the Psalms (73–98), 2002 John E. Rotelle, ed., ISBN 1-56548-167-4, ISBN 978-1-56548-167-1, part 3, vol. 18, p. 236. ↑ Martin Luther's Preface to the Letter of St. Paul to the Romans cf. Luther's comments in his treatise on The Adoration of the Sacrament (1523) in which he refers to the words of institution of the Eucharist as being "the sum and substance of the whole gospel". Luther's Works, American Edition, St. Louis and Philadelphia: Concordia Publishing House and Fortress (Muhlenberg) Press, vol. 36 (Word and Sacrament II (1959)), , p.277. ↑ The 1522 "Testament" reads at Romans 3:28: "So halten wyrs nu, das der mensch gerechtfertiget werde, on zu thun der werck des gesetzs, alleyn durch den glawben" (emphasis added to the German word for "alone"). ↑ Martin Luther, On Translating: An Open Letter (1530), Luther's Works, 55 vols., (St. Louis and Philadelphia: Concordia Publishing House and Fortress Press), 35:187–189, 195; cf. also Heinz Bluhm, Martin Luther Creative Translator, (St. Louis: Concordia Publishing House, 1965), 125–137. ↑ Swan, James. "Luther Added The Word "Alone" to Romans 3:28?". February 05, 2006. Retrieved 29 March 2014. This article incorporates text from a publication now in the public domain: Easton, Matthew George (1897). "Romans, Epistle to the". Easton's Bible Dictionary (New and revised ed.). T. Nelson and Sons. Fitzmyer, J. A. (1992). Romans. Anchor Bible Commentary. New York: Doubleday.